In 1966, during an official visit to the White House, Australian Prime Minister, Harold Holt proclaimed that Australia would go “all the way with LBJ [U.S. President Lyndon Baines Johnson]” in relation to the Vietnam War. An “all the way” with the U.S.A. approach to Australian foreign policy is erroneous, however, and, importantly, has not always been the approach taken by Australian governments to foreign affairs. In fact, many Australian governments have, in part, implemented an independent foreign policy. Thus, a fully independent Australian foreign policy, which is well overdue, is feasible. A truly independent Australian foreign policy would consist of Australian foreign policy always being determined by Australia’s government, rather than due to pressure applied by U.S. administrations. It would also involve Australian governments supporting U.S. foreign policies that are in Australia’s national interests, rather than solely to reinforce and bolster the U.S.-Australia alliance. Prime Minister Gough Whitlam’s response to the 1972 U.S. “Christmas bombings” of North Vietnam demonstrates the importance of an independent Australian foreign policy. In December 1972, in the midst of the Vietnam War, President Richard Nixon’s administration conducted an 11-day major bombing campaign in North Vietnam known as the Christmas bombings. This campaign, which constituted an attempt to encourage North Vietnamese leaders to negotiate a peace settlement with the United States, resulted in approximately 2,000 Vietnamese civilian casualties. In response, Whitlam, a longstanding opponent of the Vietnam War, wrote a letter to Nixon strongly criticizing the bombings. Nixon was infuriated by the letter and did not respond. Whitlam’s successor, Malcolm Fraser, was a Cold War warrior during his prime ministership and a vehement U.S. supporter. Nonetheless, as prime minster, Fraser opposed Presidents Nixon and Gerald Ford’s policy of trading and negotiating with the United States’ Cold War antagonist, China. More recently, Prime Minister John Howard’s staunch support of the United States is arguably most clearly manifested in his decision to commit Australian forces to the 2003 invasion of Iraq, an invasion which was not sanctioned by the United Nations Security Council. As a result, some commentators have labeled him an unqualified supporter of the United States, particularly President George W. Bush’s administration. However, even he did not walk in complete lockstep with Washington. In 1999, unlike Bush, Howard committed Australian troops to INTERFET, a peacekeeping mission which restored security and peace in Timor-Leste following an outbreak of violence by pro-Indonesian militias in response to East Timorese overwhelmingly voting in favour of independence from Indonesia. Moreover, despite the fact that the Bush administration commenced U.S. nuclear cooperation with India, Howard’s successor, Prime Minister Kevin Rudd, blocked Australian uranium sales to nuclear weapons armed-India as it is not a signatory to the Nuclear Non-Proliferation Treaty. Most recently, in 2015, under the vehemently pro-U.S. Tony Abbott’s government, Australia joined the Asian Infrastructure Investment Bank (AIIB), despite the Obama administration pressuring the Abbott government to stay away. The United States has refused to join the AIIB, which was created by China to counter-balance the U.S.-led World Bank and the Japan-led Asian Development Bank. The Abbott government’s joining of the AIIB indicates that a fully independent Australian foreign policy enables Australia to strengthen its economic and diplomatic relationships with states in our region. The Whitlam and Rudd governments’ actions indicate that a fully independent Australian foreign policy is required for a different reason: because U.S. administrations have implemented a number of highly questionable foreign policies. A fully independent Australian foreign policy is also necessary as an Australian foreign policy that is dependent on the United States negatively affects the Chinese’s government’s perceptions of Australia and arguably inhibits the strengthening of Australia’s relationship with its largest trading partner. For example, Prime Minister Julia Gillard’s 2011 decision to agree to host 2,500 U.S. marines on rotation in Darwin was viewed with hostility by the Chinese government. 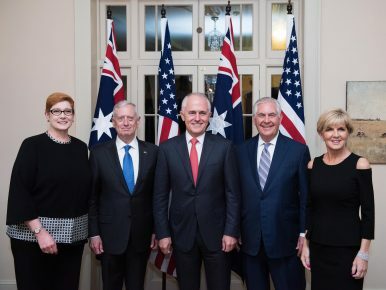 In the era of the erratic President Donald Trump, a truly independent Australian foreign policy is arguably more necessary than at any other time in Australia’s history. Adopting Trump’s foreign policies could damage Australia’s relationships with other states as well as its international reputation. Therefore, Prime Minister Malcolm Turnbull and Foreign Minister Julie Bishop need to heed the advice of academics and former Prime Ministers Fraser and Keating, and adopt a truly independent Australian foreign policy. Olivia Tasevski is an International Relations tutor at the University of Melbourne, where she completed her Bachelor of Arts (Honors) and Master of International Relations. She specializes in human rights issues in Indonesia and the history of U.S. foreign relations.